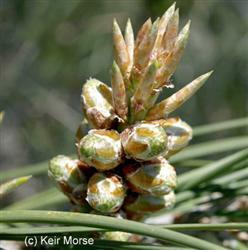 The foliage of this pine is an open gray-green. Its open structure gives light shade and if the lower branches are pruned back it makes a great place to plant other plants under its branches. Its large seed is edible and the root fibers were made into baskets by the Native Americans.